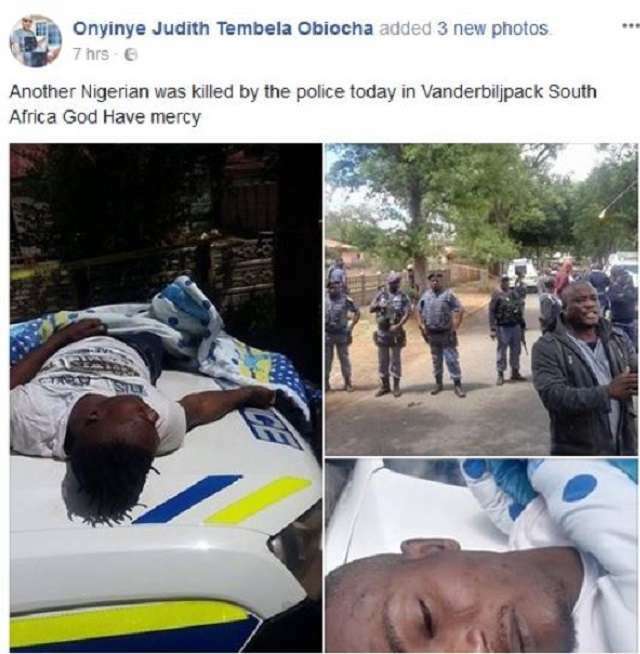 A Nigerian student, Ibrahim Badmus, has become another victim of police brutality as he was murdered by policemen in South Africa after they suffocated him to death during an arrest over drug peddling allegations, Owojela’s Blog reports. Confirming the incident, the Consul General of the Nigerian Mission in South Africa, Godwin Adama, told the Media on the telephone from Johannesburg that Badmus was killed on Tuesday at Vaal Vereniging, Vanderbijlpark Triangle, near Johannesburg. The victim's friends who posted the sad news on the social media, however, said he was just a victim of circumstances as he was not a drug peddler as alleged by the SA Police. One of the deceased's friends, Emeka Okoh who posted the news and photos on Facebook, said some police operatives had raided Badmus's house and in the process, handcuffed him and continuously sprayed pepper on him and covered his face with a nylon bag and he suffocated and died. "The SA Police have killed another young Nigerian student on allegations of drug peddling. They raided his house in Vanderbijlpark Triangle, handcuffed him, covered his face with nylon and used excessive pepper spray on him before he passed out and died due to suffocation. He was accused of selling drugs, although no evidence was presented. How long will they continue to do this to our people? Rest in peace Ibrahim," another of his friends posted. “They accused him of selling stuff, but he doesn’t; he told them he doesn’t but they used tear gas on him,” another Nigerian posted. 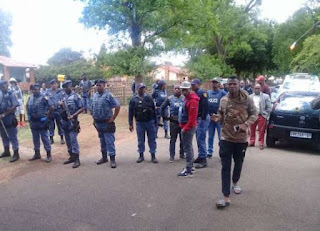 It was also gathered that some Nigerians living in the area had taken to the streets protesting the murder of the young student while also calling on the Nigerian government to do something about the regular killing of its citizens by their South African Police. The killings of Nigerians by the South African Police have been on the rise in the recent past with the police often defending their actions by saying the victims were either resisting arrest or had tried to swallow drugs and in the process, suffocate to death. But in all of these, the Nigerian government has been paying lip service to the protection of its citizens in the Diaspora and it has become worrisome.